Release tension and rebalance your posture and mobility. Self massage with foam rolling and yoga tune up techniques. Gentle powerful movements to bring awareness and quality to your movement. Move well before you move more. We practice in pairs for support, feedback and fun. 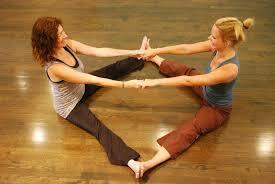 Breathing together, moving together in easy yoga poses, massaging each other(fully clothed). Resting together. Great way to connect with yourself and a partner/friend/sister etc. A powerful Yin yoga practice for the Liver Meridian. One of my favorite practices. Shifts stuck energy making space for great potential. Nourishes hip joints. Nourishes Liver energy. Gives you drive and direction.